The world’s 4 main central bankers love being in the media spotlight. After decades climbing the academic ladder, or earning millions with investment banks, they have the opportunity to rule the world’s economy – or so they think. None of these roles are noted for their contact with ordinary people. Nor does their habit of flying First Class and staying in top-class hotels, or being chauffeur-driven to meetings, help them to engage with the real world. Mark Carney’s travel expenses currently average £100k/year ($130k), in addition to his £250k/year housing allowance. But the main disadvantage is simply that common sense is not a core requirement for the job. If it was, then none of the stimulus policies enacted since 2000 – subprime, QE, Abenomics etc – would ever have been considered. Common sense would have told them that people create demand – not economic models or financial markets. And anyone used to working with real people would know that the key to demand is (a) the existence of a “need”, or at least a “want” and (b) the ability to afford the purchase. Last week’s announcements by the Federal Reserve and the Bank of Japan highlight the disconnect. Unsurprisingly, Yellen and Kuroda’s stimulus policies have completely failed to create sustained demand. Instead, they have destroyed price discovery in financial markets and created asset bubbles instead. “Japan has the world’s oldest population, as well as a low birth rate and little immigration, but its growth problems go far deeper. In the early 1990s, the country’s postwar growth boom collapsed—decades of deflation followed and Japan started to suffer a shortage of workers…. “Japan’s debt burden far outstrips that of other countries, largely a result of the stimulus introduced to help fix the economy. Abenomics, Prime Minister Shinzo Abe’s rescue plan, has helped to weaken the yen and boost corporate profits but wages and domestic spending have remained fragile.  Japanese government debt is more than twice GDP at 247%. The OECD median is equally worrying at 82%: debt in the other G7 economies ranges from 82% (Germany) up to 156% for Italy. Slowly but surely, the world is realising that central bank policies have been a disaster for the global economy. Common sense tells us that simplistic “solutions”, such as printing money and lowering interest rates, will never succeed in creating sustainable economic growth. 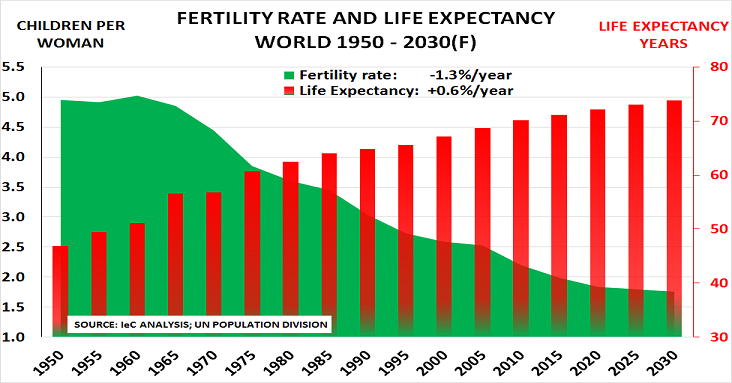 The real need is for policy to address the cause of the growth slowdown – the impact of the 50% rise in global life expectancy since 1950, and the 50% fall in fertility rates. The world’s central bankers would have been sacked long ago if they were CEOs running companies. They would also have been voted out, if they were elected officials. Not only have they failed to achieve their promised objectives – constant growth and 2% inflation – they have kept failing to achieve them since the Crisis began in 2008. “It should have been apparent that most central banks’ pre-crisis models – both the formal models and the mental models that guide policymakers’ thinking – were badly wrong. None predicted the crisis; and in very few of these economies has a semblance of full employment been restored. The ECB famously raised interest rates twice in 2011, just as the euro crisis was worsening and unemployment was increasing to double-digit levels, bringing deflation ever closer. “U.S. officials are increasingly concerned other countries aren’t doing enough to boost demand at home, relying too heavily on exports to bolster growth. “Counting on cheap currencies as a shortcut to boosting exports can create risks across the global economy, as nations fight to stay ahead of their competitors”. But in fact, US Q1 growth was just 0.5%, and inflation rose by only 0.1% in March. But still, they refuse to recognise the economic impact of demographic change. 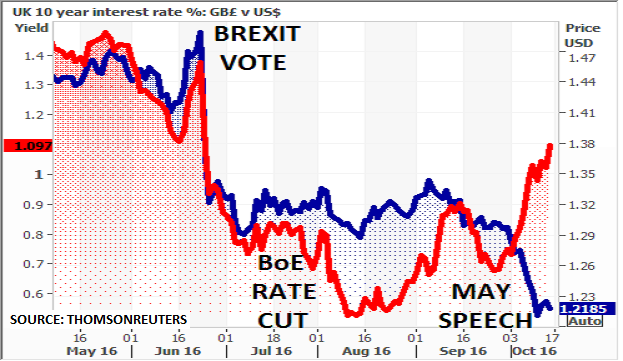 Instead central bankers are now starting to fight amongst themselves. Each wants a lower value for their currency – even though common sense says this is impossible – and is also irrelevant to meeting the challenge of ageing populations. So we continue to move through the Cycle of Deflation, as the chart shows. We are heading, if nothing changes, towards major currency wars. And it is no surprise that populist politicians such as likely Republican Presidential candidate, Donald Trump, are now starting to argue for trade protectionism to preserve jobs.